From the start, we had every obstacle in our way. Before we even had our first date, my employer announced we were relocating 6 states away.. in 4 months. But summer was nearing and, cautiously, we started spending time together – the 3 of us – how’s that for romance? Seeing a big shouldered man play with a teenage-mutant-ninja-turtled little boy softened my wounded heart. One night we wrangled a sitter & decided to see the movie we were hearing a lot about, “When Harry met Sally.” Understand, Mr. Hubbs doesn’t like movies. Doesn’t go to movies. Didn’t know it then but he accommodated …me. Can’t hear this song without thinking of him and that summer we fell in love .. over playdates with a 5-year-old, and day trips to New York City. Update: we moved, he moved too, we married, had 2nd son, lived, loved and laughed together. 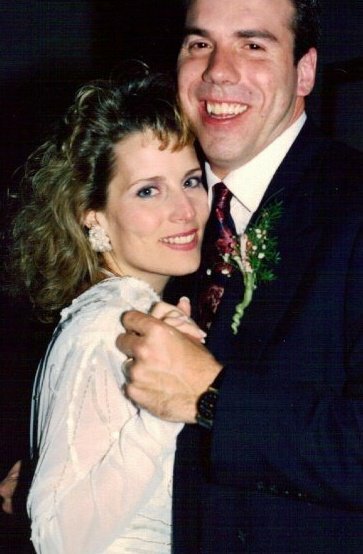 And here we are … 19 years later.. and tonight’s “date night!” Think I’m gonna dig out our Harry Connick cds for later … And our 5-year-old boy? He’s now a grown man, married to his love who brought a 5-year-old boy to their marriage. That little boy.. you guessed it .. he loves Teenage Mutant Ninja Turtles, too. Happy Anniversary! Hope date night is a great night. Thank you; I love it when things work out, too (smile). Thanks so much for the link to this post. Happy tears in my eyes, especially after reading that your daughter-in-law also graced the family with a five-year-old rascal. Happy belated anniversary, dear MJ.